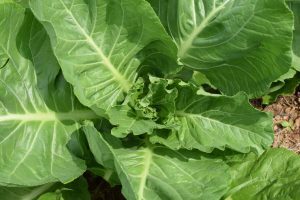 A hybrid of Asian greens and cabbage. I like to think of it as an open-leaf cabbage, with a crisp texture and cabbage-y flavor. This is more of a spring vegetable and is only somewhat available in summer and fall. This green is best sauteed lightly in oil until wilted, or braised with your favorite protein.